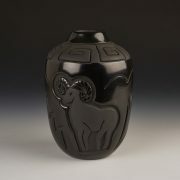 In this beautiful carved jar, Harrison has used a bear with heartline design, on all three sides. The bear design is used by most of the Rio Grande Pueblo potters and is supposed to represent virility and strength. Made in 2001, deeply carved and well-polished, this is a nice example of Harrison’s repetitive bear theme. Categories: Dine, Newly Acquired Contemporary Collection, Pottery Artist: Harrison Begay Jr.
Harrison Begay Jr. was born in 1961. He was raised in the small Navajo community of Jeddito, near Keams Canyon, Arizona. While he was in college, he studied to be a painter. 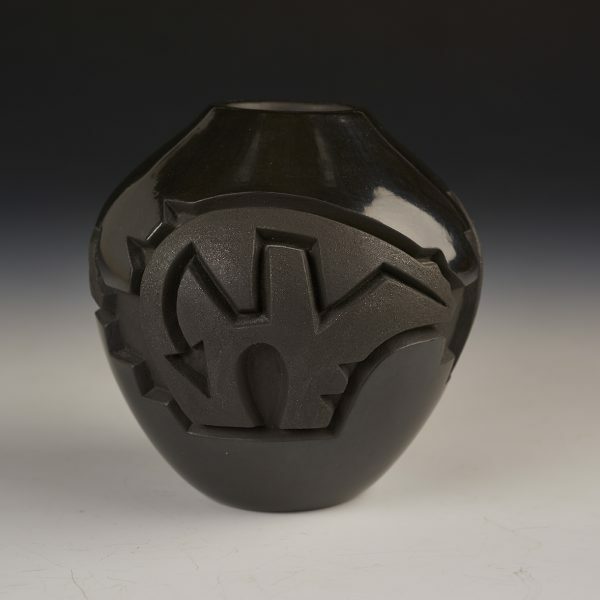 After college he turned to pottery, as an art form, and began to enter his pieces in numerous shows, winning major awards from the ’80s until the present. 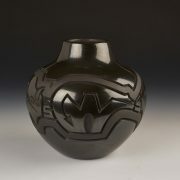 He is viewed as an innovator of Native American traditionally made pottery. Many years ago, he married a Santa Clara woman and learned the New Mexico pueblo style of pottery from his mother-in-law. Years later, his pottery shows deep clean carving and includes black, red and brown-fired pots. He now focusses on petroglyph patterns, geometric designs, and Navajo imagery. His son Daniel has become an acclaimed potter as well. Harrison is one of those potters that never rests on his laurels. He continues to try new forms, shapes and designs. His firings are magnificent, often with various areas of gun metal showing. It is always a pleasure watching artists grow and evolve, and Harrison is one of those.